When Abel's mother is approached by developers she decides she must do something to protect their fragile piece of coastline. But can Abel and his mother save Blueback and Longboat Bay in time? In the small community of Longboat Bay, ten year old Abel and his mother live off the land and spending their days in the company of one another. While snorkeling for Abalone along the pristine coastline, Abel discovers the most tremendous Blue Groper the bay has ever seen. Affectionately named Blueback, for his magnificent and brightly coloured scales, he's sly, he's playful and incredibly cheeky and Abel has fallen in love with the gentle giant. As Abel strides into his teenage years, Blueback represents his life on the coast at Robbers Head, until a local developer releases that Longboat Bay is the ideal location for tourists, but the Jackson's won't go down without a fight. It's then, when Abel realises that in order to protect the water that Blueback and the marine wildlife call home, he'll need to learn about the ocean to preserve what men are out to destroy, leaving his mother as a staunch advocate for the preservation cause. But throughout it all, Blueback is the one constant that the Jackson's are fighting for. To keep his home safe for generations to come. Tim Winton is magical. 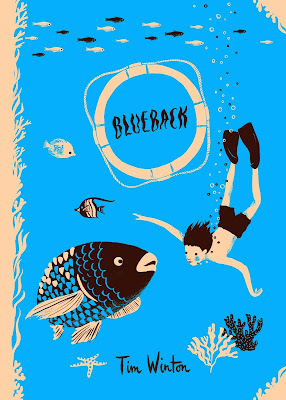 Blueback is a beautiful and whimsical story of a boy and his friendship with a Blue Groper affectionately named Blueback. For those who have never seen a Blue Groper, they are incredibly majestic and can be found in a variety in coastal waters throughout Australia, including exposed reefs. Tim Winton has used Blueback as a symbol of our marine wildlife and how it's paramount to protect our coastline. Although the storyline follows Abel from the age of ten up until he's in his thirties, it's his mother that is the shining example of an environmental warrior. After Dora Jackson's husband was taken by a Tiger Shark while diving, she has always fought for her beloved Bay through teaching Abel to respect their coast. Throughout Abel's lifetime, his mother has seen illegal poachers who threaten to destroy the Bay by illegal fishing, developers who want to spoil the magic of the serene coastal property, raising a child alone with no support and living off the land to make ends meet. She's a phenomenal role model that should be celebrated. But it's her determination to protect her coast that will resonate with environmentalists worldwide. The book reminds me a lot of Life of Pi, with the whole concept of the boat and the fish. I haven't read it either, but have a copy on my Kindle. It's a beautiful book, definitely one to purchase in a hardcover edition. A short read with such a big impact. Wow, what a beautiful book Kelly! I like how you picked up the deeper marine conservation message here, it's certainly important to spread awareness. Tim Winton is absolutely magical Jeann, I'm definitely going to grab a few of his other titles. That book is gorgeous. I think it's important to spread environmental awareness too. And books that are directed towards a younger generation can surely help them grow a lot. It really is Francine, I really adore books that have strong social and environmental messages woven throughout and this one was just lovely.